CHICAGO, Feb. 21, 2019 (GLOBE NEWSWIRE) -- Allscripts Healthcare Solutions, Inc. (Nasdaq: MDRX) (Allscripts) announced its financial results for the three months and year ended December 31, 2018. Bookings(1) were $531 million in the fourth quarter of 2018. This result compares with $314 million in the fourth quarter of 2017. For the year ended December 31, 2018, GAAP revenue totaled $1,750 million, an increase of 17 percent year-over-year. Non-GAAP revenue totaled $2,129 million, a 16 percent increase from 2017. Fourth quarter 2018 GAAP revenue was $442 million, an increase of 1 percent year-over-year. Non-GAAP revenue totaled $538 million, down 2 percent year-over-year. Contract revenue backlog totaled $3.9 billion as of December 31, 2018. Gross margin in the fourth quarter of 2018 was 42.5 percent on a GAAP basis and 47.1 percent on a non-GAAP basis, compared with 40.4 and 47.8 percent, respectively, in the fourth quarter of 2017. On a GAAP basis in the fourth quarter of 2018, total operating expenses, consisting of selling, general and administrative and research and development expenses, were $166 million, or a 13 percent decrease year-over-year. Non-GAAP operating expenses totaled $185 million, flat year-over-year. Additionally, the company recorded $9 million of legal, transaction-related and other costs in the fourth quarter of 2018. This compares with $29 million of such costs in the fourth quarter of 2017. GAAP net income in the fourth quarter of 2018 totaled $375 million compared with $6 million in the fourth quarter of 2017. Non-GAAP net income in the fourth quarter of 2018 totaled $35 million, up 7 percent when compared with the fourth quarter of 2017. GAAP diluted earnings per share in the fourth quarter of 2018 was $2.14, compared with $0.03 in the fourth quarter of 2017. Non-GAAP diluted earnings per share in the fourth quarter of 2018 were $0.20, compared with $0.18 in the fourth quarter of 2017. Adjusted EBITDA totaled $104 million in the fourth quarter of 2018, compared with $107 million in the fourth quarter of 2017. Following the close of the Netsmart transaction on December 31, total principal debt outstanding was reduced to $696 million. Net debt was $511 million as of December 31, which reflects a cash balance of $185 million. Stock repurchases totaled $37 million in the fourth quarter of 2018. Allscripts had $213 million remaining under its existing stock repurchase program as of December 31, 2018. In providing financial guidance, the company does not reconcile non-GAAP earnings per share guidance to the corresponding GAAP financial measures. Allscripts does not provide guidance for the various reconciling items since certain items that impact GAAP net income are either outside of its control and/or cannot be reasonably predicted. Please see the “Explanation of Non-GAAP Financial Measures” at the end of this press release for detailed information on calculating non-GAAP measures. For a reconciliation of other non-GAAP items, see the non-GAAP financial reconciliation tables in this release (Tables 4, 5 and 6). The GAAP condensed consolidated balance sheets, statements of operations and statements of cash flows reflect the results of Netsmart as a discontinued operation. The amounts for the 2017 period have been recast to conform to the current year presentation. Non-GAAP results include the results from Netsmart through the date of sale, which was completed on December 31, 2018. In addition, we are providing supplemental non-GAAP financial information to illustrate what Allscripts’ results would have been in fiscal 2017 and each quarter of 2018 excluding the results of Netsmart. Please see Table 7 for this supplemental non-GAAP financial information. 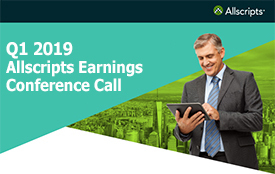 Allscripts will conduct a conference call today, Thursday, February 21, 2019, at 4:30 PM Eastern Time to discuss its earnings release and other information. Participants may access the conference call via webcast at http://investor.allscripts.com. Participants also may access the conference call by dialing +1 (877) 269-7756 or +1 (201) 689-7817 (international) and requesting Conference ID # 13686664. A replay of the call will be available approximately two hours after the conclusion of the call, for a period of four weeks, on the Allscripts Investor Relations website or by calling +1 (877) 660-6853 or +1 (201) 612-7415 - Conference ID # 13686664. Supplemental and non-GAAP financial information is also available at http://investor.allscripts.com. Bookings reflect the value of executed contracts for software, hardware, client services, private cloud hosting services, outsourcing and other subscription-based services. NOTE: All percentage changes described within this press release are calculated from full dollar amounts as illustrated in the accompanying financial statements and Allscripts Supplemental Financial Data Workbook, posted on the Investor Relations website. Rounding differences may occur when individually calculating percentages or totals from rounded amounts included within the press release body compared to full dollar amounts in the tables. © 2019 Allscripts Healthcare, LLC and/or its affiliates. All Rights Reserved. This press release contains forward-looking statements within the meaning of the Private Securities Litigation Reform Act of 1995, including the statements under “2019 Financial Outlook”. These forward-looking statements are based on the current beliefs and expectations of Allscripts management, only speak as of the date that they are made and are subject to significant risks and uncertainties. Such statements can be identified by the use of words such as “future,” “anticipates,” “believes,” “estimates,” “expects,” “intends,” “plans,” “predicts,” “will,” “would,” “could,” “can,” “may,” and similar terms. Actual results could differ from those set forth in the forward-looking statements and reported results should not be considered an indication of future performance. Certain factors that could cause Allscripts actual results to differ materially from those described in the forward-looking statements include, but are not limited to: the expected financial contribution of businesses acquired by us, including the EIS business, the NantHealth provider/patient solutions business, Practice Fusion and HealthGrid; the successful integration of businesses recently acquired by us; the anticipated and unanticipated expenses and liabilities related to the EIS business, the provider/patient solutions business, Practice Fusion and HealthGrid, including with respect to requests from the U.S. Attorney’s Office for documents and information related to our EIS Business and Practice Fusion; security breaches resulting in unauthorized access to our or our clients’ computer systems or data, including denial-of-services, ransomware or other Internet-based attacks; Allscripts failure to compete successfully; consolidation in Allscripts industry; current and future laws, regulations and industry initiatives; increased government involvement in Allscripts industry; the failure of markets in which Allscripts operates to develop as quickly as expected; Allscripts or its customers’ failure to see the benefits of government programs; changes in interoperability or other regulatory standards; the effects of the realignment of Allscripts sales, services and support organizations; market acceptance of Allscripts products and services; the unpredictability of the sales and implementation cycles for Allscripts products and services; Allscripts ability to manage future growth; Allscripts ability to introduce new products and services; Allscripts ability to establish and maintain strategic relationships; risks related to the acquisition of new businesses or technologies; the performance of Allscripts products; Allscripts ability to protect its intellectual property rights; the outcome of legal proceedings involving Allscripts; Allscripts ability to hire, retain and motivate key personnel; performance by Allscripts content and service providers; liability for use of content; price reductions; Allscripts ability to license and integrate third party technologies; Allscripts ability to maintain or expand its business with existing customers; risks related to international operations; changes in tax rates or laws; business disruptions; Allscripts ability to maintain proper and effective internal controls; and asset and long-term investment impairment charges. Additional information about these and other risks, uncertainties, and factors affecting Allscripts business is contained in Allscripts filings with the Securities and Exchange Commission, including under the caption “Risk Factors” in the most recent Allscripts Annual Report on Form 10-K and subsequent Form 10-Qs. Allscripts does not undertake to update forward-looking statements to reflect changed assumptions, the impact of circumstances or events that may arise after the date of the forward-looking statements, or other changes in its business, financial condition or operating results over time. (1) The condensed consolidated balance sheets reflect the results of Netsmart as a discontinued operation. The amounts for the 2017 period have been recast to conform to the current year presentation. (1) The condensed consolidated statements of operations reflect the results of Netsmart as a discontinued operation. The amounts for the 2017 periods have been recast to conform to the current year presentation. (2) During 2018, we changed the presentation of certain bundled revenue streams and the associated cost of revenue which were previously included as part of Software delivery, support and maintenance revenue. Under the new presentation, these amounts are included as part of Client services revenue and cost of revenue, respectively. We have recast previously reported revenue and cost of revenue amounts to conform with the new presentation. This change in presentation had no impact on previously reported gross profit, net income (loss) or earnings (loss) per share. Note: Adjustments to reconcile GAAP to non-GAAP net income are presented gross of tax, with net tax effects included in row titled "Tax effect of adjustments to reconcile GAAP to non-GAAP net income". (a) Transaction-related and other costs included in cost of revenue, operating expenses and non-operating expenses are comprised of the following for the periods presented as well as the net impact of businesses treated as discontinued operations. (a) Transaction-related has been adjusted from the amounts presented in the reconciliation of GAAP and non-GAAP income from operations, as shown in Table 4, in order to remove the accelerated amortization of assets to be disposed from transaction-related and other costs since such amortization is also included in depreciation and amortization. (b) Interest expense and other, net has been adjusted from the amounts presented in the statements of operations in order to remove the amortization of the fair value of the cash conversion option embedded in the 1.25% Cash Convertible Notes and deferred debt issuance costs from interest expense since such amortization is also included in depreciation and amortization. (c) Adjusted EBITDA margin is calculated by dividing adjusted EBITDA by non-GAAP revenue. (a) Gross margin is calculated by dividing gross profit by non-GAAP revenue. (b) Adjusted EBITDA margin is calculated by dividing adjusted EBITDA by non-GAAP revenue. Non-GAAP revenue consists of GAAP revenue, as reported, and adds back recognized deferred revenue from the EIS business, Practice Fusion, HealthGrid, NantHealth’s provider/patient engagement business and non-material consolidated affiliates that is eliminated for GAAP purposes due to purchase accounting adjustments as well as revenue from businesses treated as discontinued operations. Non-GAAP gross profit consists of GAAP gross profit, as reported, and excludes acquisition-related deferred revenue adjustments, acquisition-related amortization, stock-based compensation expense, non-cash asset impairment charges and transaction-related and other costs. Non-GAAP gross margin consists of non-GAAP gross profit as a percentage of non-GAAP revenue in the applicable period. For the fourth quarter of 2018, non-GAAP gross margin totaled 47.1 percent, consisting of non-GAAP gross profit of $253.5 million divided by non-GAAP revenue of $538.4 million. For the fourth quarter of 2017, non-GAAP gross margin totaled 47.8 percent, consisting of non-GAAP gross profit of $261.2 million divided by non-GAAP revenue of $546.8 million. Reconciliations to GAAP gross profit are found in Table 4 within this press release. Non-GAAP operating expense consists of GAAP selling, general and administrative expenses (SG&A) and research and development expense (R&D), as reported, and excludes transaction-related and other costs and stock-based compensation expense recorded to SG&A and R&D. For the fourth quarter of 2018, non-GAAP operating expense totaled $185.4 million, consisting of $100.0 million of GAAP SG&A and $66.1 million of GAAP R&D expense and excluding ($27.6) million of total transaction-related and other costs and $8.3 million of stock-based compensation expense recorded to SG&A and R&D. For the fourth quarter of 2017, non-GAAP operating expense totaled $185.5 million consisting of $123.1 million of GAAP SG&A and $68.4 million of GAAP R&D expense and excluding ($1.1) million of transaction-related and other costs and $7.1 million of stock-based compensation expense recorded to SG&A and R&D. Please note operating expense totals may not sum due to rounding. Adjusted EBITDA is a non-GAAP measure and consists of GAAP net income/(loss), as reported, and adjusts for: acquisition-related deferred revenue adjustments; depreciation and amortization; stock-based compensation expense; transaction-related and other costs; non-cash asset and long-term investment impairment charges; gain on sale of businesses, net; interest expense and other, net; equity in net earnings of unconsolidated investments; and tax provision (benefit). Non-GAAP effective income tax rate is based on non-GAAP pre-tax earnings and consists of the statutory federal income tax rate, Allscripts effective state income tax rate and adjustments for permanent differences. Non-GAAP net income consists of GAAP net income/(loss), as reported, and adds back acquisition-related deferred revenue adjustments; acquisition-related amortization; stock-based compensation expense; transaction-related costs; non-cash asset and long-term investment impairment charges; non-cash charges to interest expense and other, asset impairment charges; gain on sale of business, net; and equity in net earnings of unconsolidated investments and the related tax effect of the aforementioned adjustments. Non-GAAP net income also includes a GAAP to non-GAAP tax rate alignment adjustment. Non-GAAP net income attributable to Allscripts Healthcare Solutions, Inc. is a non-GAAP measure and consists of non-GAAP net income, as described above, with an adjustment to reduce non-GAAP net income for the percentage of non-controlling interest outside Allscripts ownership position. For this non-GAAP presentation, Netsmart preferred stock is treated as if it was converted to common stock until December 31, 2018 when we sold our entire interest in Netsmart. Non-GAAP earnings per share consist of non-GAAP net income, as defined above, divided by weighted shares outstanding – diluted during the applicable period. Free cash flow consists of GAAP cash flows provided by operating activities in the applicable period, net of capital expenditures and capitalized software costs, including those incurred by businesses presented as discontinued operations. Acquisition-Related Deferred Revenue Adjustments. Deferred revenue adjustments include acquisition-related deferred revenue adjustments, which reflect the fair value adjustments to deferred revenue acquired in a business acquisition. The fair value of acquired deferred revenue represents an amount equivalent to the estimated cost plus an appropriate profit margin, to perform services related to the acquiree's software and product support, which assumes a legal obligation to do so, based on the deferred revenue balances as of the acquisition date. Allscripts adds back acquisition-related deferred revenue adjustments for its non-GAAP financial measures because it believes the inclusion of this amount directly correlates to the underlying performance of Allscripts operations. Acquisition-Related Amortization. Acquisition-related amortization expense is a non-cash expense arising primarily from the acquisition of intangible assets in connection with acquisitions or investments. Allscripts excludes acquisition-related amortization expense from non-GAAP gross profit, non-GAAP operating income, and non-GAAP net income because it believes (i) the amount of such expenses in any specific period may not directly correlate to the underlying performance of Allscripts business operations and (ii) such expenses can vary significantly between periods because of new acquisitions and full amortization of previously acquired intangible assets. Investors should note that the use of these intangible assets contributed to revenue in the periods presented and will contribute to future revenue generation, and the related amortization expense will recur in future periods. Stock-Based Compensation Expense. Stock-based compensation expense is a non-cash expense arising from the grant of stock-based awards. Allscripts excludes stock-based compensation expense from non-GAAP gross profit, non-GAAP operating income, non-GAAP operating expense, non-GAAP net income and Adjusted EBITDA because it believes (i) the amount of such expenses in any specific period may not directly correlate to the underlying performance of Allscripts business operations and (ii) such expenses can vary significantly between periods as a result of the timing and valuation of grants of new stock-based awards, including grants in connection with acquisitions. Investors should note that stock-based compensation is a key incentive offered to employees whose efforts contributed to the operating results in the periods presented and are expected to contribute to operating results in future periods, and such expense will recur in future periods. Transaction-Related Costs. Transaction-related costs relate to certain legal proceedings, consulting, severance, incentive compensation and other charges incurred in connection with activities that are considered one-time as well as the net impact of businesses treated as discontinued operations. For the year ended December 31, 2018, Allscripts incurred $98 million of transaction-related and other expenses, which included $29 million allocated to fund the Allscripts annual incentive cash bonus plan that was contingent on the consummation of the sale of the OneContent business. Allscripts excludes transaction-related costs, in whole or in part, from non-GAAP gross profit, non-GAAP operating income, non-GAAP operating expense, non-GAAP net income and Adjusted EBITDA because it believes (i) the amount of such expenses in any specific period may not directly correlate to the underlying performance of Allscripts business operations and (ii) such expenses can vary significantly between periods. Non-Cash Charges to Interest Expense and Other. Non-cash charges to interest expense include the amortization of the fair value of the cash conversion option embedded in the 1.25 percent Cash Convertible Notes issued by Allscripts during the second quarter of 2013. Asset impairment charges. Asset impairment charges include (i) the write-off of purchased third-party software as a result of our decision to discontinue several software development projects, (ii) the write-off of acquired technology and value assigned to commercial agreements, and (iii) the write-off of the book value of certain fixed assets that resulted from consolidating business functions and locations. Impairment of Long-Term Investments. Impairment of long-term investments relates to other-than-temporary non-cash impairment charges associated with such investments based on management’s assessment of the likelihood of near-term recovery of the investments’ value. The amounts recorded during the year ended December 31, 2018 relate to a non-cash impairment charge related to two of our cost-method equity investments and a related note receivable. Gain on sale of businesses, net. Gain on sale of businesses, net for the year ended December 31, 2018 consists of $177.9 million gain, partly offset by $5.6 million loss, from the divestitures of our OneContent and Strategic Sourcing businesses, respectively, both of which were acquired as part of the EIS transaction during the fourth quarter of 2017. Equity in Net loss (income) of Unconsolidated Investments. Equity in net loss (income) of unconsolidated investments represents Allscripts share of the equity earnings of our investments in third parties accounted for under the equity method, including the amortization of cost basis adjustments. Tax Rate Alignment. Tax rate alignment aligns the applicable period’s effective tax rate to the expected annual non-GAAP effective tax rate. Management also believes that non-GAAP revenue, gross profit, gross margin, operating expense, effective income tax rate, net income, earnings per share, Adjusted EBITDA, and free cash flow provide useful supplemental information to management and investors regarding the underlying performance of Allscripts business operations. Acquisition accounting adjustments made in accordance with GAAP can make it difficult to make meaningful comparisons of the underlying operations of the business without considering the non-GAAP adjustments provided and discussed herein. Management also uses this information internally for forecasting and budgeting, as it believes that these measures are indicative of core operating results. In addition, management may use non-GAAP gross profit, operating expense, operating income, net income, earnings per share and/or Adjusted EBITDA to measure achievement under Allscripts stock and cash incentive compensation plans. Note, however, that non-GAAP gross profit, operating income, net income earnings per share and Adjusted EBITDA are performance measures only, and they do not provide any measure of cash flow or liquidity. Allscripts considers free cash flow to be a liquidity measure that provides useful information to management and investors about the amount of cash generated by the business after capital expenditures and capitalized software costs. Free cash flow provides management and investors a valuable measure to determine the quantity of capital generated that can be deployed to create additional shareholder value by a variety of means. Non-GAAP financial measures are not in accordance with, or an alternative for, measures of financial performance prepared in accordance with GAAP and may be different from non-GAAP measures used by other companies. Non-GAAP measures have limitations in that they do not reflect all of the amounts associated with Allscripts results of operations as determined in accordance with GAAP. Investors and potential investors are encouraged to review the definitions and reconciliations of non-GAAP financial measures with GAAP financial measures contained within the attached condensed consolidated financial statements.